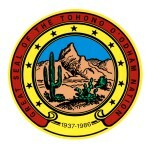 The Tohono O’odham Nation is comparable in size to the state of Connecticut. Its four non-contiguous segments total more than 2.8 million acres at an elevation of 2,674 feet. Within its land the Nation has established an Industrial Park that is located near Tucson. Tenants of the Industrial Park include Caterpillar, the maker of heavy equipment; the Desert Diamond Casino, an enterprise of the Nation; and, an 23 acre foreign trade zone. Of the four lands bases, the largest contains more than 2.7 million acres. Boundaries begin south of Casa Grande and encompass parts of Pinal and Pima Counties before continuing south into Mexico. San Xavier is the second largest land base, and contains 71,095 acres just south of the City of Tucson. The smaller parcels include the 10,409-acre San Lucy District, located near the city of Gila Bend, and the 20-acre Florence Village, which is located near the city of Florence. The landscape is consistently compelling: a wide desert valley, interspersed with plains and marked by mountains that rise abruptly to nearly 8,000 feet. As of December, 2000, the population was reported at nearly 24,000 people. San Lucy District – Chairman Albert Manuel Jr. The San Xavier district is known for the San Xavier Mission Del Bac, the White Dove of the Desert. In addition to this magnificent mission, the area maintains an Indian arts and crafts market. Nearby Baboquivari Mountain Park has picnic facilities. Gaming was authorized August 11, 1993 and on October 12 of that year, the Desert Diamond Casino opened. The casino offered visitors a choice of 500 slot machines which has resulted in the Nation being the 13th largest employer in the area, representing over 2,400 jobs. In 1995 the facility was expanded to include bingo and live card dealers as well as 500 slot machines. A second, smaller casino, Golden Hasan opened 1999, and has 100 slot machines. The Desert Diamond Casino, open 24 hours, and is located at 7350 South Old Nogales Highway in Tucson, Arizona. Basic community services are available on the “main”, Gila Bend and San Xavier reservations.